In a large size bowl, add chicken, capsicum, carrot and broccoli. Pour the soup mixture over the chicken and vegetables. Stir until well combined. Place the chicken mixture into a casserole dish. Break the bread into small pieces and evenly spread over the top of chicken mixture. Sprinkle with cheese. 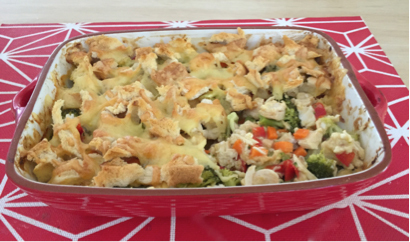 Bake for 30-40 minutes or until the chicken mixture is hot and bubbling and the topping has browned.